The West Bank of the Nile in the Luxor area is known as the Theban necropolis. There are great numbers of archaeological sites, especially funerary sites and monuments, including the Valley of the Kings, the Valley of the Queens, private tombs, mortuary temples for the New Kingdom pharaohs. The site of the palace of Amenophis III at Malqata is situated to the south of the mortuary temple of Ramesses III (Medinet Habu). This site is a unique from other sites on the West Bank of Thebes in that it is not a funerary monument, but the site of the actual royal city. The Archaeological Mission of Waseda University started its first archaeological excavation at the Malqata-south site in January 1972. In January 1974 we discovered a mud brick building with a colored staircase in the "Kom al-Samak" which was built by Amenophis III. The Malqata-south area should be located inside the territory of his palace. This important discovery of this 18th dynasty building at Malqata-south made us turn to pharaonic studies. Since then we have worked in different sites over the Theban west region, e. g. the Valley of the Kings, Dra' Abu al-Naga', al-Khokha, Shaikh 'Abd al-Qurna, the palace of Malqata. At Malqata-south, the site of our excavation, there is a temple devoted to the goddess Isis which was built in the Roman period. The temple and its vicinity are called "Deir al-Shalwit" by the local people. Our first hope in Egypt was put to the ground in December 1971. 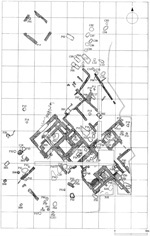 Field surveys were carried out for eight seasons until January 1979 and laboratory investigations continued for a further three seasons at al-Qurna village. At the start of the field survey, grids of 25 m by 25 m squares were settled over this area. During nine years of digging, several sites were excavated intensively along with test excavations at the grid corners. "Roman settlement". Graves up to eighty in number were recovered through the area west of the settlement, but especially concentrated on and around the "Kom al Samak". The area seemed to be used as a cemetery by the people living in the settlement. 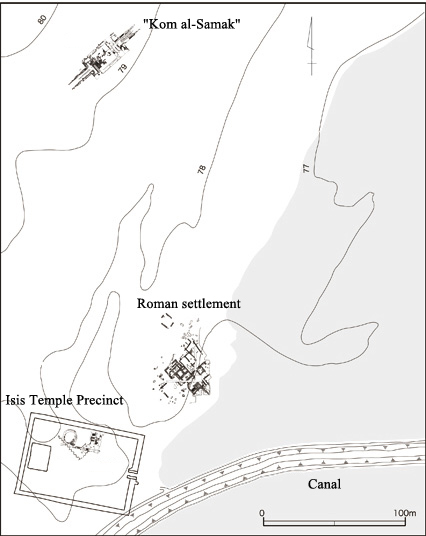 The Isis Temple, the settlement and the cemetery should be considered as the various site elements. When our field survey was commenced at the Malqata-south, pieces of earthenware were found scattered over the whole area northeast of the Isis Temple. 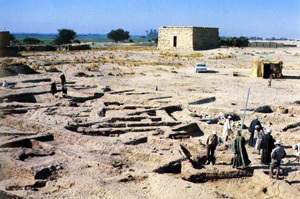 The excavation of the area was started from the desert edge near the cultivated land in 1971 and continued until 1973. As a result of the excavation, some 2, 000 square meters in area, houses built with mud bricks were uncovered. Three or four houses, each consisting of several square rooms of 3 to 3.5 m in length, were constructed, partly overlapping an older buildings. It became clear from the complexity of the brickwork that each house had been rebuilt several times. Some of the rooms were furnished with a pit and / or a furnace in one corner. 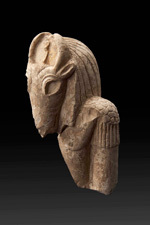 The objects excavated from the area include lamps made of terra-cotta, a statue of a woman in bronze, candlesticks, bronze cymbals (presumably for religious services), a statuette of a bull god made of limestone, coins and ostraca in addition to various kinds of earthenware. Among the coins, those belonging to the period of the Roman emperors, Trajan and Hadrian were found. The houses are thus considered to have been in use around the 2nd century A. D.
To the west side of the houses, some twenty skeletons of oxen were found buried. Their head were covered with a large piece of earthenware. These oxen are supposedly holy oxen for religious service. It could be considered from those findings that the houses may have been the dwellings of people deeply involved with the Isis Temple. Together with the excavation of the Roman settlement, test trenches were dug in several places within the area during the seasons from 1971 to 1979. As a result, many people's burial site were discovered in the area west of the Roman settlement. 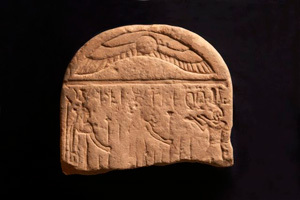 Especially, a number of clay coffins were found centered on and around the "Kom al-Samak". On the basis of the coffins and rare funerary goods, the burials were supposed to be from the Roman to the Byzantine periods, thus contemporary with the Isis Temple and the Roman settlement in part. The area in the vicinity of the "Kom al-Samak" seems to have been used as a cemetery by the local population of those days. The coffins recovered were in human-shaped. On the surface of the coffin, the face, breasts, feet, etc. are painted or appliqued with clay. 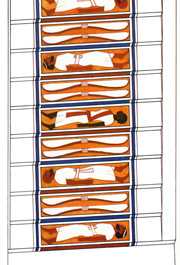 Some of the coffins are also ornamented with a lotus design. The mummies inside the coffins are not in very good condition and mostly skeletonized because of unsatisfactory mummification. Most of the bodies were buried in a stretched position. Beads, bronze accessories and pottery were found as funerary goods. 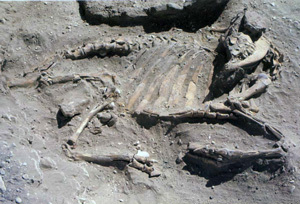 In the vicinity of the Roman settlement, up to twenty oxen were also found buried. In addition to the statuette of a Bull god discovered in the Roman settlement, this fact indicates that ox worship occurred in those days. After the Nubian International Salvage Campaign in 1960’s, extensive field works and detailed analysis shed new light on the palaeolithic age of this area, and discovered numerous previously unknown industries. Together with these academic accomplishments, our researches also have discovered many palaeolithic remains and have revealed the variability of lithic traditions in the Luxor region. In 1971 Waseda University started the archaeological research for palaeolithic period at Malqata South. In parallel with the excavation of the Roman settlement, the general survey of the palaeolithic research was conducted and collected a number of stone implements around our concession area. Following the results, we carried out the excavations on Malqata South Site, Locality M, and the slopes of Libyan Plateau. Malqata South Site is situated just on the border between the Nile alluvium and the lower desert. The excavation was conducted in a 5x5m square where a certain amount of palaeolithics was retrieved mainly from the layer of Sahaba silt. Based on the geological evidences the assemblage should be dated tentatively to the phase between the end of the Deir el Fakhri recession and the beginning of the Sahaba aggradation; 14000~12000 BC, though there have been no datable material for C14 dating. 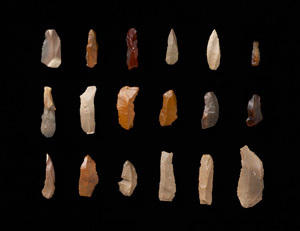 In the composition of lithic artifacts, bladelets are dominant consisting 70% of total debitages. In the tool types, assemblage consists of endscrapers, burins, perforators, backed bladelets, truncated pieces and Ouchtata retouched bladelets. In comparison with other assemblages in the technological and typological point of view, proportion of backed bladelets and the selective tool class frequencies represented the similarity between Malqata South Site and E71K12 assemblages. Another attribute such as a use of punch technique to detach bladelets from cores, lack of microburin technique and lack of Levallois technique are common characteristics to both assemblages. On the other hand, this feature is quite different from other industries such as Idfan, Silsilian and Halfan. 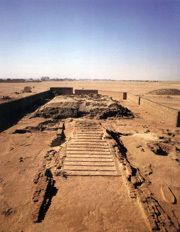 Locality M is located on the lower desert 10 meters inland from the Nile alluvium and about 1 km northeast of the Isis temple at Malqata South Site. At this locality, a small pit of 3 m square was excavated. 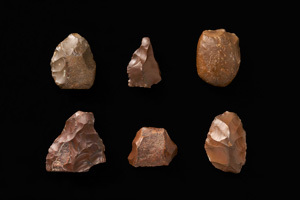 The lithic artifacts show the Upper Palaeolithic aspect which is dominated by blades and bladelets detached from opposed platform cores and single platform cores. It is difficult to date this industry since there was insufficient in the diagnostic tools as microburins and backed bladelets. At the eastern front of the Libyan Plateau formed by promontories and embayments as the result of wadi erosion, 10 different localities, labeled Loc. A to J, were chosen for the surface collection of the palaeolithic remains. Subsidiarily, a small scale excavation was conducted at Loc. B. Lithic artifacts obtained from these localities consist of scrapers, denticulates, notches, perforators, blades, flakes and cores associating with Levallois technique. Judging from the condition of patination and the size of the artifacts as well as techno-typological observation, these assemblages were classified into three distinctive industries. They occupy different chronological positions; Middle Palaeolithic, Khargan and Upper Palaeolithic. Middle Palaeolithic assemblages were discovered at Loc. A, B-1, B-2, C, E, F and G. In general, the artifacts tend to be large to medium in size. Typologically they include Levallois flakes, Levallois points, various sidescrapers, notched pieces and denticulated pieces. There were also found hollow scrapers which represent diagnostic tool type typical to regional culture around Luxor. Khargan related assemblages were collected at three points, Loc. A, D and E. These assemblages are characterized by their strong emphasis on Levallois technology for core preparation and tool typology. They are medium to diminutive in size. The assemblages contain various scrapers, endscrapers, burins, notched scrapers and denticulate scrapers. Upper Palaeolithic assemblages were retrieved at two sites, Loc. B-3 and I. They are exceedingly small in size. Typologically, they show strong emphasis on Levallois technique. Almost all the tools were manufactured from Levallois flakes, in which there are Levallois flakes, Levallois points, sidescrapers and notched pieces. Of special interest is the dominance of microblade production from single platform cores and opposed platform cores rather than from Levallois cores. Although microblade cores are found in a large amount, tools from microblades and their blank are rare. 5. Building and Mural Paintings at the "Kom al-Samak"
The "Kom al-Samak" was a small mound located in the desert about 240 m north of the Isis Temple at Deir al-Shalwit. This mound was oval in shape, about 80 m long. The mound consisted of two parts, divided by a trench made by thieves. 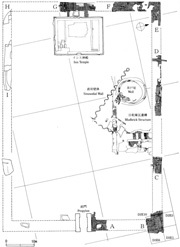 The excavation of the mound, from 1974 to 1979, uncovered the remains of a building constructed with mud bricks, having a northeast to southwest axis. The building was proven to have been reconstructed in several stages and within a short term. In the first stage the building was composed of a central platform with staircases on the southeast and the northwest sides, and a superstructure on top. In the latter stage, the platform was enlarged and a staircase added on the northeast side and a slope on the southwest side. This staircase had paintings depicted on each step. Some of the bricks found in the building bear a cartouche with the throne name of Amenophis III in the 18th Dynasty, based on which the building was dated to that king's reign. The painted staircase has 20 steps, each 3.5 m in width, 55 cm in depth and 5 to 7 cm in height. The steps were plastered and pictures were drawn on them. The motif of a pair of bows tied in the middle and a figure of a captive alternatively decorated the steps. The captives are of three different races: from their features, they are assumed to be Nubians, Syrians, and another Asian tribe. All of them are wearing white ropes and have their hands tied behind and standing on tiptoes. Judging from the drawing of such captives, this building seems to have been used for a ceremony relating to Amenophis III (according to the study made thereafter, the staircase seems to have had 30 steps in its original state). 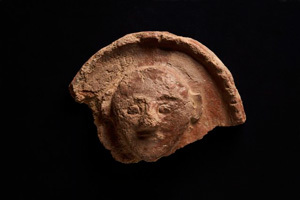 Fragments of mural paintings were the most conspicuous finds among items excavated at the "Kom al-Samak". The painted plasters seem originally to belong to the wall paintings drawn on the internal or external walls of the building. One of the reasons they have remained even today is that though the original building were demolished, the building material from older constructions were reused in later periods. 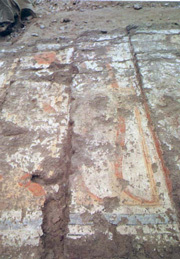 Some of the mural paintings were found as fillings in the south slope. Other pieces seem to have been left behind when the later building was destroyed. Those found on the central platform seem to be such pieces. Thousands of fragments were excavated from the "Kom al-Samak". These vary in size, ranging from 30 x 50 cm to very tiny bit. The patterns on these fragments may be classified into two major types. One is a geometric pattern presumably painted on the ceiling and the edges of the wall inside the buildings. The other consists of different patterns such as human figures, animals, plants, vessels and votive offerings, which were painted within the space surrounded by the geometric patterns. Colors such as black, blue, red, green, yellow and white were used (the pigments used are mineral-based similar to those used in other Egyptian paintings). The style of drawing is also considered to be similar to that employed in the paintings found in private tombs of those days. General view of "Kom al-Samak"
The precinct of the Isis Temple is surrounded by a large enclosure wall made of mud bricks, the foundation of which still remains today. The area within the wall is rectangular in shape and its size is 74 x 51 m. The pylon and the propylon constructed with sandstone blocks, still remain standing. This temple was first studied by K. R. Lepsius in the mid 19th century, although no detailed report has been made. The French mission directed by Ch. Zivie recently researched inscriptions on the pylon and the propylon. According to these inscriptions, construction of the existing temple was dated to the period around the beginning of the first century A. D.
During the seasons from 1971 to 1979, clearing of the enclosure wall and excavation of a well were carried out in the precinct. However, a major part of the precinct has been left untouched. A well site is located in the northwestern precinct of the Isis Temple and was a shallow depression overgrown with weeds before the excavation. 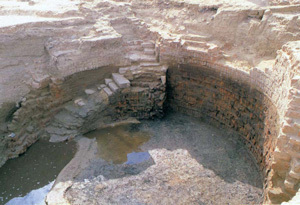 The excavation of the well was carried out in the seasons from 1976 to 1979. The well itself was constructed by digging a pit of about 11 m in diameter and laying a baked brick wall on the inside of the pit. On the southeast side of the well, there is a staircase made of sandstone blocks, thus permitting anyone to get down along the inner wall into the well. In the fillings of the well, thirty-two strata were detected up to the point 4 m below the ground where further excavation was impossible due to the water spring. 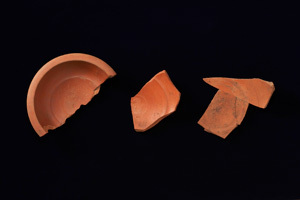 The earthenware, abundantly excavated from the well, is broken in most cases. It seems that such deposits formed because broken pottery and ashes were thrown into the well as waste once the well fall out of use. Remains consisting mainly of earthenware were excavated from the well in considerable numbers. Table ware, amphorae and painted pots and jars were especially remarkable. Among them, there were some fragments with a mark of cross, indicating the Christian faith in Egypt known as "Copt". The cross and other features of the earthenware enable us to date the major part of the objects in the well to the Byzantine period, although an upper part of a stela, which was a rare example from the Graeco-Roman period, was included as well. The well itself could be loosely dated to the Roman period. Though some of the burial plots were supposed to belong to the Byzantine period and a scattering of pottery fragments similar to those from the well have been detected on the northwest side of the temple area, settlements contemporary with the objects inside the well have not yet been precisely located so far.